Your reader offers up a rather boilerplate “liberal” or “Ben Affleckian” response to a terrorist attack: the reasons the perpetrators gave for the attack are not the “real” reasons for it, but rather lack of education, poor treatment, alienation, etc. While I do believe that these factors can play a role in radicalization, they do not explain the attack on Charlie Hebdo. In fact, while claiming to be searching for “the whole story” or at least “the central one,” your reader fails to recognize the predominate and most obvious cause of the horrendous attack: religious dogma. In fact, the reader seems to go out of his way to avoid mentioning religion at all. He characterizes the cartoons (or other’s hypothetical opinions of the cartoons) as “racist slurs” (Islam is not a race) and the attack itself as “political violence.” Now, Islamism, like all theocracy, is indeed partly political. But it is also religious. If this were political violence, why wasn’t the target political? If the cause was poor education, strict immigration policies, and under representation in government, why not target a school or a government building? No, this act of terror was religious violence. The gunmen shouted “God is great” as they murdered journalists and artists. They did so because their religious dogma states that anyone who insults or depicts the prophet Muhammad deserves death. Islamists do not seem to mind free speech when that speech is used to disparage Christians, Jews, gays, or other infidels. They only mind when someone breaks the rules of their religious dogma. Any attempt to frame the whole story, or the central story, of the Charlie Hebdo attacks which does not mention religious dogma is inane, hypocritical, and self-defeating. 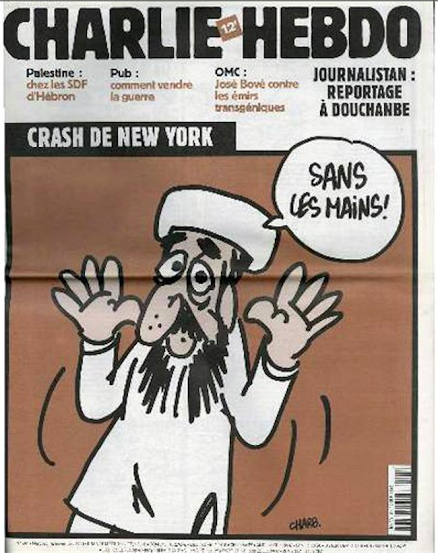 I have seen some of Charlie Hebdo‘s cartoons over the years and found some of them amusing, some of them repulsive. More than a few of them I’ve found out-and-out racist, and worse. I’ve thought they were racist against precisely people who, in French society, are the down-and-out, the outcast. It’s the kind of satire which I think can be ugly because it targets not the powerful, but the powerless. On balance, I don’t particularly care for Charlie Hebdo. But I was reading about the people killed, and in particular the cartoonists, and I found myself weeping for a style, a tradition, a discourse: for human people murdered before they were done exploring what it means to live, to love, to laugh. I haven’t liked their cartoons, not always. But they have a style their own. A rhythm their own. A life their own. They are art in a tradition, a tradition whose contributors will now never contribute again to its growth, its development. People grow up. I grew up in the South and occasionally said or did things which were racist, and worse. I sometimes targeted the powerless, not the powerful. And I am thankful I have yet to be murdered for it, thankful that I had a chance to try again, to be again, to live again, to speak again. To murder for free expression, even repugnant free expression, is irreligious blasphemy. It denies the person who you think is atrocious, the person who you think is abhorrent, the person who you think is blasphemous, and it denies them the opportunity for redemption. If you believe that God will stand at the end of time in judgment on all humanity, you owe your fellow human beings the chance to redeem themselves in the arc of time, in the arc of their life, to live to a ripe old age, to have a million moments, a million chances, to redeem where they have fallen short. You owe it to them. If your religion demands you kill, then you worship a weak God indeed, a God who has no business standing in judgment over anyone. I heard the Apostle of Allah (p.b.u.h) say – “There were two men among the Banu Isra’il (the Jews) who were striving for the same goal. One of them would commit sin and the other would strive to do his best in the world. The man who exerted himself in worship continued to see the other in sin. He would say to the other “refrain from it”. One day he found him sinning and again said to him “refrain from it”. The other responded – “Leave me alone with my Lord. Have you been sent as a watchman over me?”. The one who exerted himself in worship replied – “I swear by Allah, Allah will not forgive you, nor will He admit you to paradise”. Then their souls were taken back (they died) and they met together with the Lord of the Worlds. Allah said to the man who had striven hard in worship – “Had you knowledge about Me or power over that which I had in My hand?” Allah said to the man who sinned – “go and enter paradise by My mercy.” He said about the other “Take him to hell”. I am not saying the staff of Charlie Hebdo was foolish or evil, just pointing out that if the Kouachi brothers felt they were, their faith provided them with a radically different way to deal with them than the one they chose … a choice which led to the murder of twelve innocent people including a muslim (Ahmed Merabet – the cop they so casually shot in the head). As Michel Houellebecq said in the Paris Review interview you linked to yesterday: “the most obvious conclusion is that jihadists are bad muslims”.